I woke up this morning craving for a brinjal roast with rice and pappu pulusu. With numerous stuffings to chose from I finally decided on a stir fry recipe which calls for toasted, coarsely ground spices stuffing for the brinjals that are roasted on slow fire till you achieve a succulent yet crisp texture. Small, purple tender brinjals work best for this recipe. Makes a delectable side with rice and pappu pulusu or sambar. Add 1/2 tsp oil in a cooking vessel, add coriander seeds and stir fry till it turns slightly dark in color. Remove. Similarly, add channa dal and urad dal, roast till them till they turn red and remove. Dry roast dry red chillis, methi seeds and cumin together for 2 mts and remove. Cool the dry roasted ingredients. Add turmeric pwd, salt, tamarind, hing to these roasted ingredients and grind them all together to a coarse pwd. It should not be wet. In the same vessel, add the remaining oil, add curry leaves and toss them for a few seconds. Place the stuffed brinjals in the oil and cook on high flame for 4-5 mts. Now, cover with lid and let them cook on medium flame for 10-12 mts. Keep checking in between and stir fry to ensure they don't burn or stick to the pan. Now on low flame nicely roast the brinjals without lid. It should take 35-40 mts for the brinjals to cook inside and be well roasted. Serve with rice, pappu pulusu or sambar and papad. Love it, Sailu, will try with Japanese Eggplants, hate those US style gigantic Eggplants we get here! Hi Sailu, I tried this recipe for lunch today and it came out very good. We all loved it at our home, including my 20 months old son. I too used the microwave oven after the first 10 minutes of roasting to quicken the process and then brought it back to the stove for it to get crispy and it turned out great. Thanks for the recipe. Beautiful pics Sailu. V likes brinjals. I will try this stuffed brinjal next time when I find good ones here. Sailu, This recipe is my all time fav…and I dish it out exactly this way so frequently at home. My grandma used to deep fry kharm pettina gutti vankayalu in oil , but slowly we became health conscious -in recent times we started to shallow fry them just like u did…Heavenly dish- I feel like eating it as is right away without rice- by omitting step#4 serving suggestion. Being from coastal andhra, u know I can go on ranting about such dishes…Thank you for bearing. Do you know that if you look at the bottom of the eggplant, you will see an indentation. 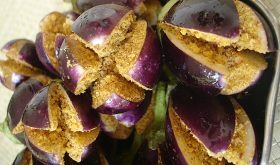 The female eggplant will have a deeper indentation and therefore will have more seeds inside. Looks delicious Sailu! My husband loves a variation of this, ennai katrikai- But I’ve stopped making it because of the Humungous amounts of Oil it consumes. Did this brinjal grow in your yard? Beautiful pictures. Yes, ms, traditionally prepared this recipe takes in a lot of oil but it can still taste good with less oil. Yesterday, I had visited my ancestral home at our village (an hour’s drive) and picked the brinjals from the backyard garden. wow! !amazing Sailu!….vankaya karam pettina kura adirindhi..meeru pettina photo mouth watering ga vundi. this one is my all time favorite! I can see the crunchy texture of the filling on the pic 🙂 not a great brinjal lover, but i do like them roasted or stuffed! I’m quite against brinjals, but i’ve had these andhra stuffed small brinjals before, and they’re quite delicious! lovely photos! Its our Andhra specialty :D.. sumthing anyone can drool for Sailu. the pic looks gorgeous..
Hi Sailu, I would like to know how to bake them in Oven, I mean for how much time and on what temperature…as it won’t consume much oil. It will definitely consume much less oil if you broil/bake. I haven’t tried the baking method but if I were to try, I would spray oil all over the stuffed brinjals and roast it in a pan for 10 mts and then wrap in foil and bake for 35-40 mts at 350 degrees. If you do try this method, do let me know how it turned out. I have tried 3 times so far to make stuff brinjal.. no idea that why taste came out bad everytime… Though brinjal is my favourite but I feel good just to look at the recipe… Still not very good in cooking brinjal.. I will try urs.. it is looking very templting. Hai Sailu, Good morning. Brinjal curry dish looks awesome!!!! It tempts me and makes me hungry…. It will go well with curd rice. Thanks a lot Sailu. Sailu, I am not at all a Brinjal freak but this recipe has opened my eyes. I love to try it. Great pictures, thanks for the idea. yummyyyyy….i just made engayi today….brinjal is my all time fav…..though i had my lunch today….seeing the pics u have posted makes me hungry all over again:-)))))awesome pics…which camera is this? I’m drooling just looking at the pics. Love vankaya anytime of the day in any form. Thanks for the delicious recipe Sailu. Excellent !! is what comes to my mind reading your post & looking at those beautiful pictures. Will try them when I find good brinjals here in US. You love brinjals don’t you? The most good looking vegetable, now I had to laugh for that. This is a different stuffed brinjal than the one I am used to and it looks delicious. Thq u for the good recipe, me & my hubby both love this recipe very much. I will surely try this recipe. I have small doubt, can we use the ready made curry masala sold in the market? if we stuff this masala and place in oil, will all the masala come out? shall we tie the brinjals with thread after stuffing? plz do suggest. Saipriya, I am not sure about the ready made masala your talking about. If you follow the stuffing recipe and the method mentioned above, the stuffing masala will come out a little bit but not completely. Whatever little masala that comes out will coat the outer skin of brinjals while slow roasting. Just now tried this recipie exactly the way you mentioned above. Initially I was skeptical about the very little oil you mentioned. But to my surprise, it turned out very well and tasted delicious. Thanks for such a nice recipie which consumes very little oil and tastes heavenly. That looks beautiful! I must agree with the Andhra love for eggplants – any gathering will have an eggplant entree or sidedish, all delicious! And the sheer variety of stuffings and masalas in them is amazing! It looks so good, I am craving this now! M made this dish over the weekend and it came out fantastic! We had leftovers tonight! and WoW! tastes even better! I have been following your blog since a long time but this the first time I am leaving a msg. I like the way you present your recipe more than the recipe itself. Whenever I am at loss of recipes I try to get them from your blog. Thanks for sharing such nice recipes. hello, sailu, ilked this reciepe and pics shown here. i wud like to ask why cant we make this dish with gravy? hi. I looked at a lot of websites, your stuffed vankaya is closest to the authentic dry koora i remember my mom making! All the others had wet gravy – which is not how I remember guthi vankaya koora. Thanks – I have tried this before, but will try the baking option this time around. THanks for the clear and concise recipes, and of course the lovely mouth watering pictures :). I tried this recipe yesterday for lunch. it turned out gr8 and tasty. But the oil i added was a bit more than u specified. If i didn’t added more oil the brinjals were sticking to the pan. Where could i have gone wrong?? I would love to make this recipe with less oil. Thanks for sharing ur recipes with us. I even tried ur Tomato perugu pachhadi, beerakaya pachhadi. Chaala bagunnayi. Today i am making tomato coriander chutney. I have made these chutneys before but ur versions are bit diff from mine so wanted to try them. The trick is in combining the brinjals quite often during the cooking process so that they don’t stick to the pan. Thanks for this recipe. When ever I forget any recipe, I come here to refer and remind myself how my mother did the same. I did try few of your recipes too. Apply little oil to the brinjals, stuff them with the powder. Place them vertically in a pan that is suitable for baking. sprinkle little powder on these brinjals, then little oil and few drops of water to make them stick together. I normally use the microwave and a 1/4kg brinjals are done in 5 minutes. My aunt says that baking would take the same time, if done at high temperature. I never tried it. It tastes the same as dry recipe. to have gravy, I add few more drops of oil and water. I am growing eggplants and always looking for new ways to keep my family eating veggies with me. I am the only vegetarian in the family. Not only do I love your recipe and the beautiful pictures, I also love the fun, descriptive way you write. Everyone who reads your recipe will want to make it! i am currently preparing this using ur recipe.. The brinjals have started burning a little..
so i had to add little water..